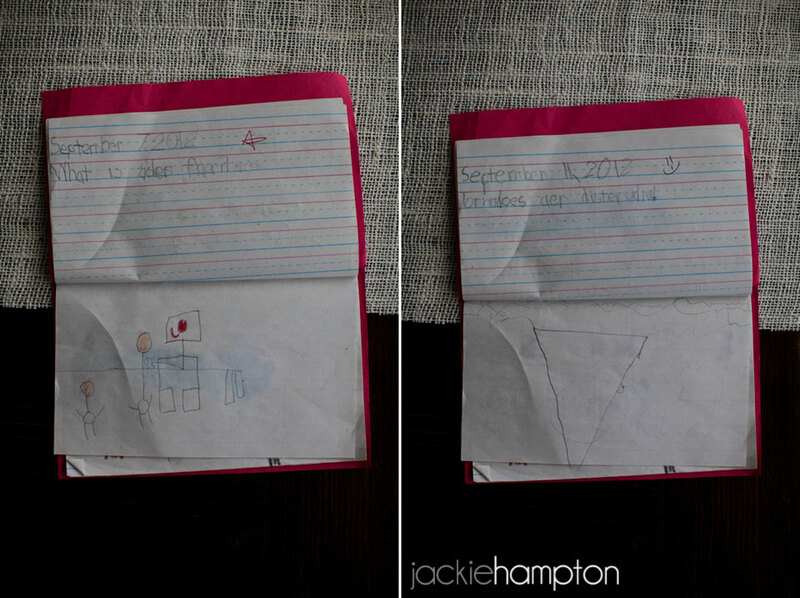 Jackson’s teacher has been requiring the kids to keep a journal in class this year. They started out writing simple sentences and have moved up to short paragraphs. Mostly they write about whatever they want to and draw a picture to illustrate. 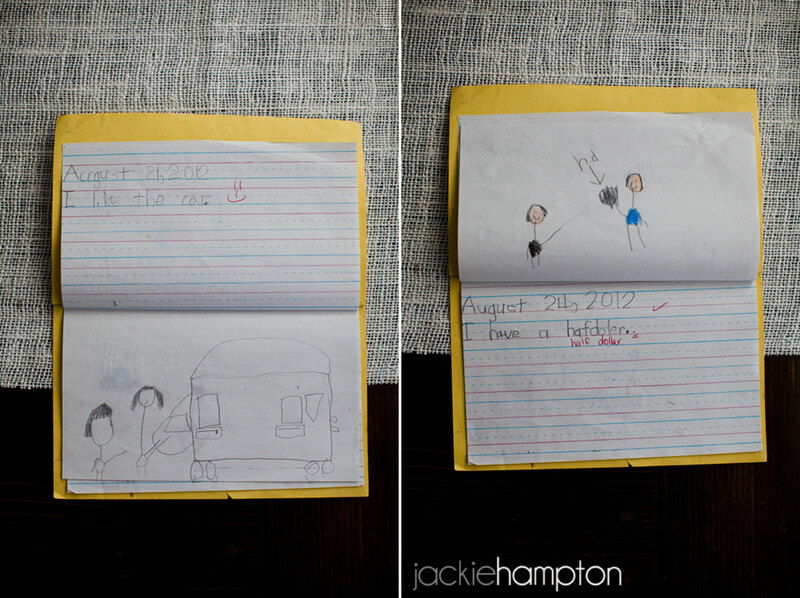 Jackson brings his journal home at the end of every month and I sit in eager impatience waiting for it to arrive. 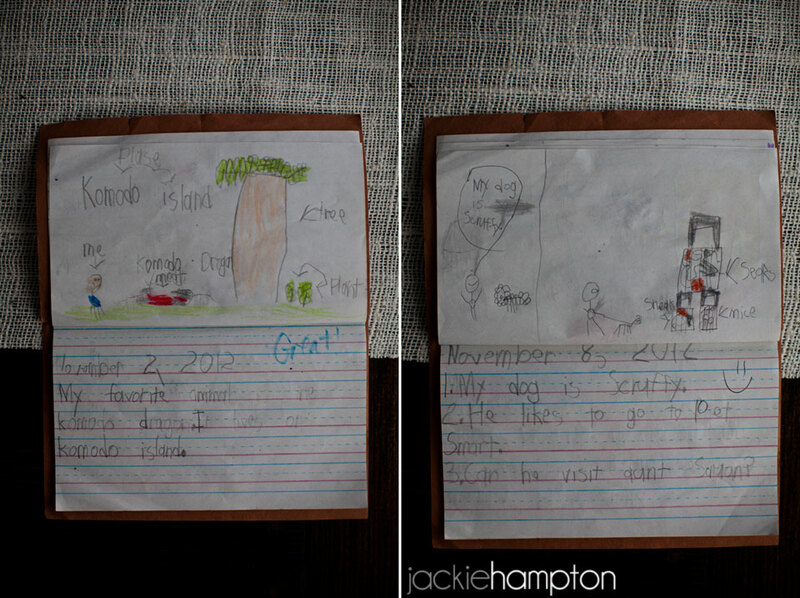 I asked Jackson if I could share a few of my favorite entries on the blog and he gave the thumbs up. So here ya go. “I have a half dollar.” clearly it made a big impression. “He is watching WTVM news leader 9.” - Caleb, I told you those TV cords were unsightly. “Mom said Wii time is over.” - and now I’m the bad guy. 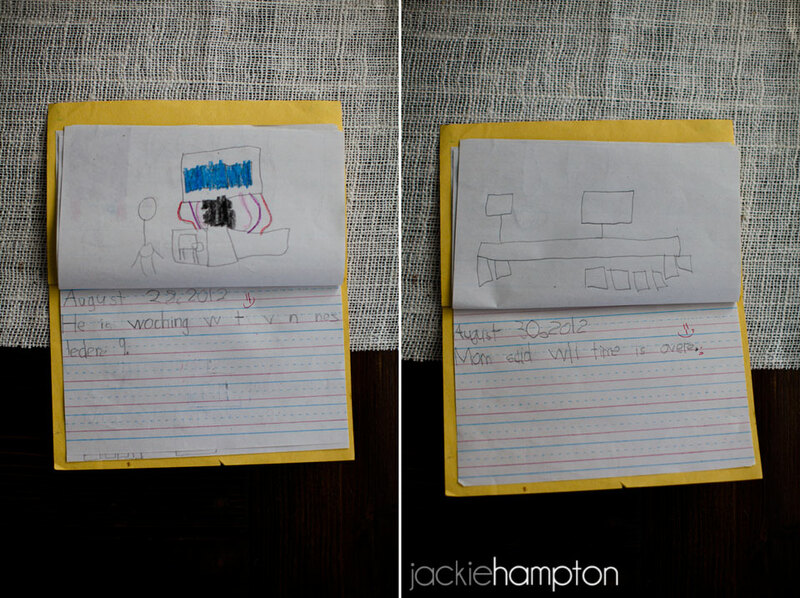 “?” - I’m not sure what this one says, but doesn’t the TV look better after we fixed the cords? “Tornadoes are destructive.” – fact. “The snake moved his body.” - during this phase he began drawing illustrations with no background. “My dog can run. Her cat is black.” - again. No background. “When I was a baby I could throw food on the floor. When I was a big kid I could read.” - now THIS is the proper way to restrain a child in a highchair. “They are pingwins. They say hello by flapping and singing.” - I shall be spelling pingwins this way forevermore. “The bears cleaned up. One ate the mess.” - sometimes I clean the kitchen this way too. “That elephant is so big. It weighs a ton! Do you like elephants?” - the elephant is standing on a scale that says “ton”. “My favorite animal is the komodo dragon. It lives on Komodo Island.” - that documentary was clearly a teeny bit graphic. “My dog is scruffy. He likes to go to PetSmart. 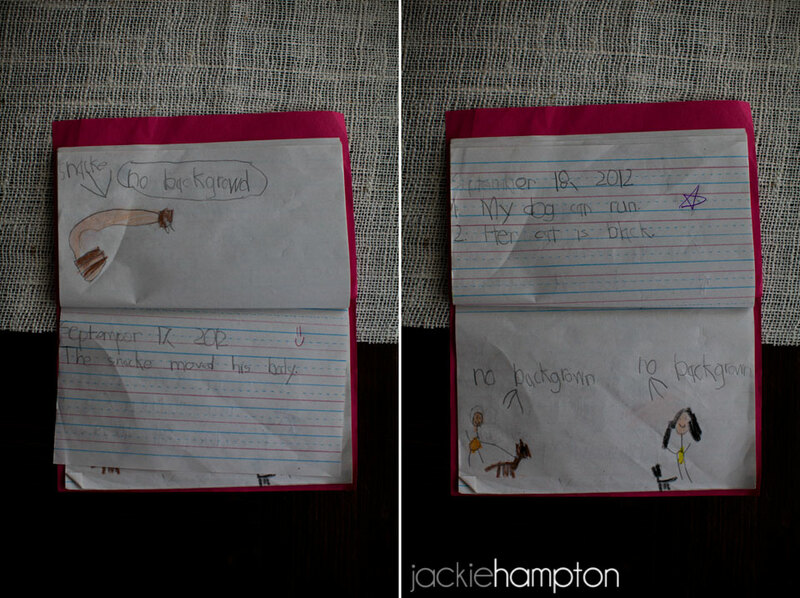 Can he visit Aunt Susan?” - we don’t know an Aunt Susan, but that’s definitely our dog. 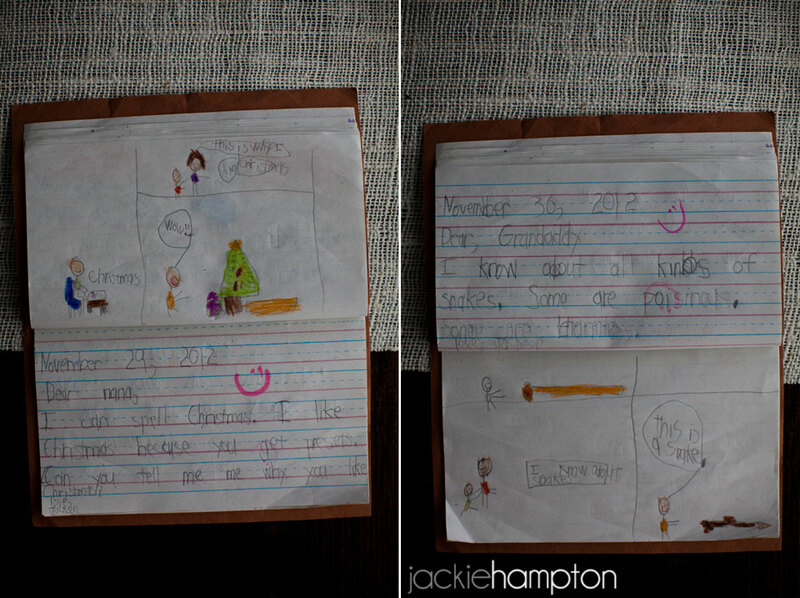 “Dear Nana, I can spell Christmas. I like Christmas because you get presents. Can you tell me why you like Christmas? 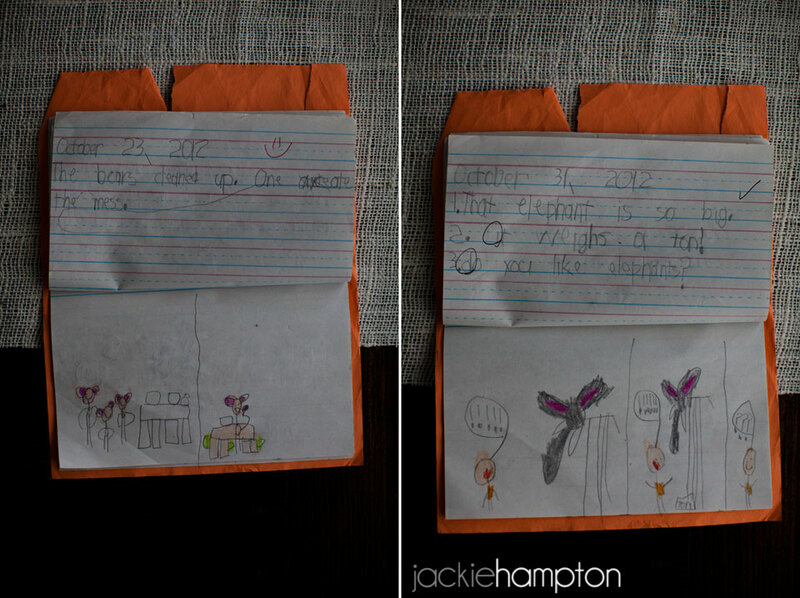 Love, Jackson” - honest letter to his Nana. That’s her in the top panel. 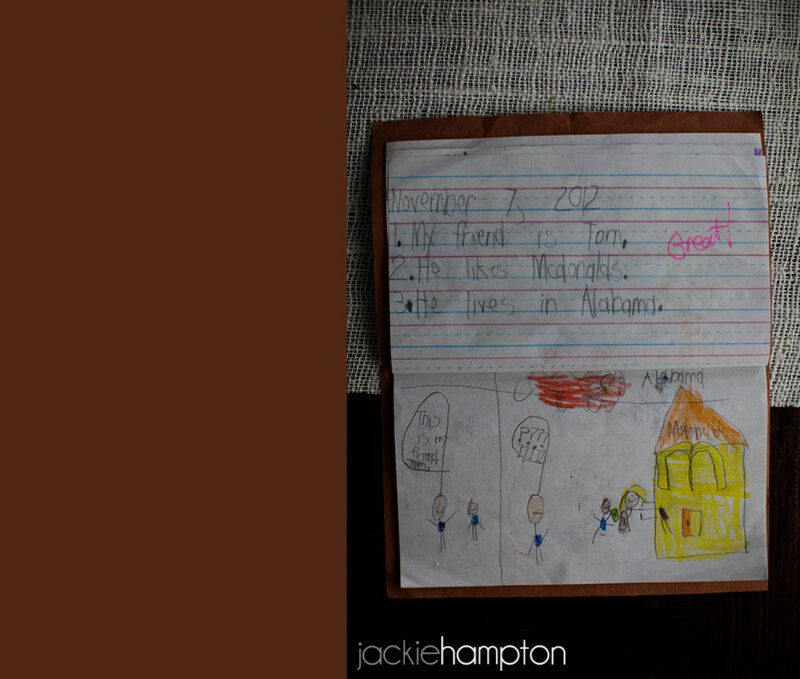 “Dear Grandaddy, I know about all kinds of snakes. Some are poisonous. Some are harmless. 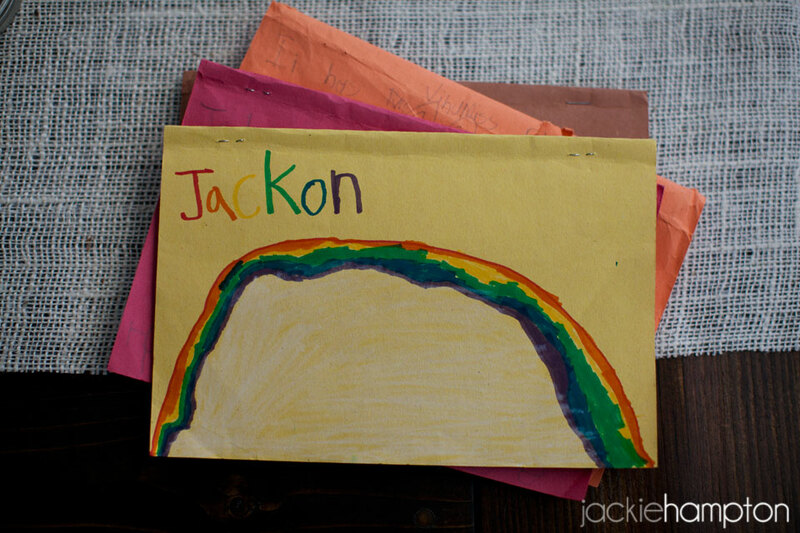 Love, Jackson” - informative letter to his Grandaddy. That’s him in the bottom left panel. “My friend is Tom. He likes McDonalds. He lives in Alabama.” - the dude with nine ????? over his head is Jackson. He’s confused because Tom likes McDonalds? Or because it’s about to rain ketchup? Or because Tom’s mom is car-less in the drive-through. Priceless. 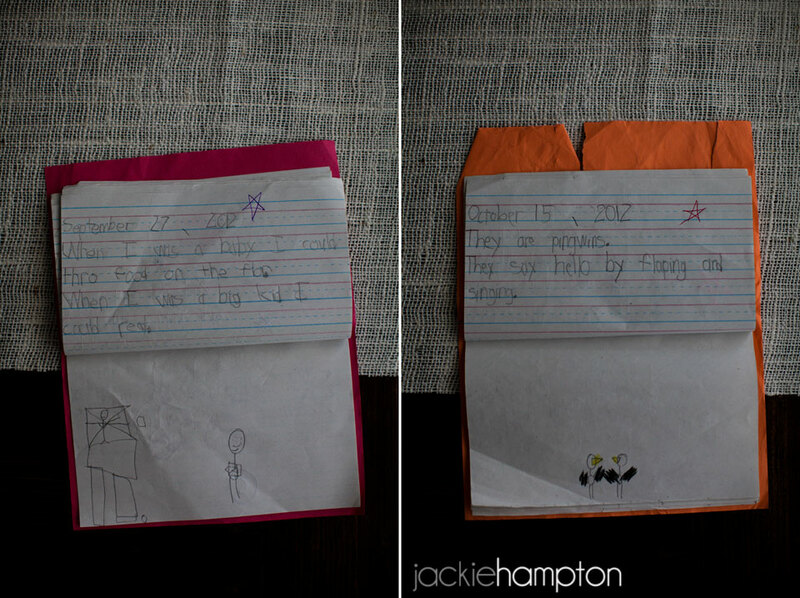 And this is why I want to teach Alex to read and write. These were awesome! Hope you are all doing well! Merry Christmas!